Discover the fashion triangle of city shopping Melbourne within only three city blocks. Tucked away in lanes and shopping areas are the hot fashion spots of Melbourne shopping. There you will find Melbourne fashion designers, unique international labels, as well as all the other recognized brands. This Melbourne fashion shopping precinct includes the glamorous QV, Melbourne Central, and the GPO, and all the many shops in between. Furthermore, then there are also the glamorous cafes and shops in Melbourne arcades and lanes. 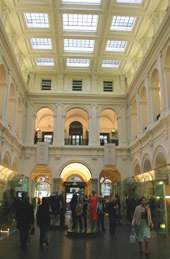 The QV is Melbourne’s new retail paradise. Developed on the former Queen Victoria Hospital sight, it is designed more like a village with laneways and piazzas rather than a shopping centre. You can lose yourself wandering around its laneways, taking in all the fashion, food and entertainment – or meet up with friends, stop for coffee, lunch or dinner along the European style piazza. It is located on the corner of Lonsdale and Swanston Streets and is easily missed from the main roads, unless you know what’s behind the glass facade. QV is the heart of fashion shopping Melbourne – or at least one of them. There are top national and international designers, the latest in casual and street wear, as well as boutiques with the next season fashion straight from Milan and Paris. 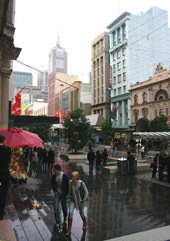 Melbourne Central is just across Swanston Street, between LaTrobe and Lonsdale Streets. It has the Melbourne Central city loop train station in its basement. It is a shopping and entertainment complex built around the old Coops Shot tower. The tower is enclosed by a huge glass cone that has become a distinctive architectural feature in Melbourne’s northern city skyline. 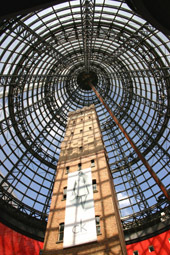 In the tower is the Central Shot Tower Museum detailing life in Melbourne in the last 170 years. From the basement up to level two, Melbourne Central is filled with over 300 stores – from beauty and Hair to urban streetwear labels and contemporary fashion, to books and home wares to al fresco laneway dining, cafes and restaurants and a large cinema complex at the top. The shops become classier on the top floors with international fashion and unique local designer on the top shopping level. The GPO is on the corner of Elizabeth and Bourke Streets. It was built in the mid 1800s in the height of the gold boom fashion, and today houses high level fashion in its marvellously renovated heritage building. Over four levels you find stores of seriously sophisticated fashion and Melbourne’s finest labels, such as Lisa Ho, Zimmermann, Mimco, Rodd & Gunn, Wayne Cooper, Metalicus, Georg Jensen and Akira. David Jones is the department store with class. It is located in Bourke Street Mall and is committed to selling exclusive goods of quality. While department shopping has lost its dominance in recent times, this is nevertheless a great one-stop shop for almost everything – enhanced by ambient music and a great food hall. Just next door to it is Myers, the department store with perhaps less class but not necessary less style, and with all your retail needs under one roof. Completing the shopping Melbourne triangle is also Elizabeth Street and Bourke Street Mall with many specialty shops on the way. And really, this is just the beginning. There are particular areas where the high end fashion shops in Melbourne are located, and there are the famous Melbourne lanes and arcades with their unusual quirky and eclectic shops.